Despite the currency being replaced by the euro, Germans are still have some 12.9 billion in old Deutschmarks, an equivalent of €6.6 billion, the German central bank estimated. Nostalgia is the primary motive for keeping the old coins and notes. Germany abolished the Deutschmark in 2002, when it entered the Eurozone. When European currencies were unified the Bundesbank started changing marks into euros at a fixed rate of about DM 1.96 per euro and will continue to do so indefinitely. But a large number of the obsolete banknotes and coins remain, if not in circulation then in possession of the general populace, the bank reported this week. 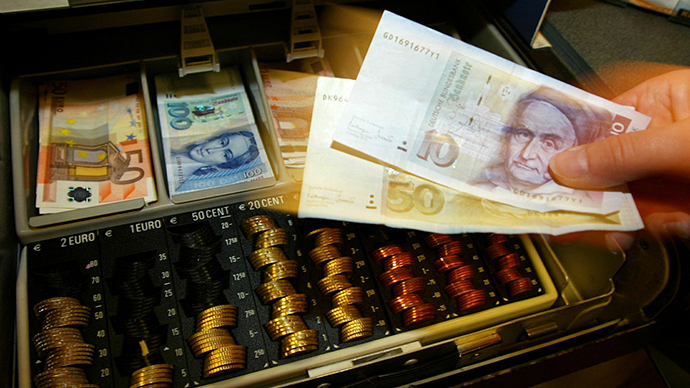 Its estimates say Germans hold 169 million notes and 24 billion coins of various denominations. Divided by Germany’s population of 81 million, this translates into an average of 82 euros per person. Naturally, less-valuable coins are the Deutschmarks the Germans are reluctant to part with. More than half of those had not been converted, while only four percent of banknotes were returned to the Bundesbank. Old stashes of hoarded marks are being regularly discovered during renovations of old houses. They fuel a small but steady flow of annual Deutschmark conversions, which amounted to €52.1 million in 2014. Nostalgia seems to be the most prominent motive for keeping good old D-marks. According to a poll conducted by the Emnid institute for Postbank, 74 percent of Germans with Deutschmarks in their pocket see a sentimental value in them. Some 24 percent keep part of their savings in the old currency, while 22 percent simply forgot to convert their assets, the poll showed. Some of the marks are likely to have vanished outside of Germany, particularly in Eastern Europe, where the Deutschmark served as a second currency in the early 1990s, but also elsewhere in the world, as the currency was considered stable enough to store value.